It was a good day at the office Thursday, Ballymore Stables taking two horses to the Bendigo meeting and cheering them both home to victories. We kicked off the day in winning fashion with Timeless Style breaking her maiden in courageous fashion at her sixth outing. Suited by a step up to 2200m, the daughter of High Chaparral was always travelling nicely for Luke Currie, sitting just off the leader before joining that horse before the turn. Really getting the upper hand late, Timeless Style held off late challenges, showing both stamina and heart. A Magic Millions graduated selected by Paul Moroney, Timeless Style must inherit her staying capabilities from her Epsom Derby winning sire as her family is one of mostly speed. A half-sister to four winners, she is out of a full sister to the Group winning sprinters Super Elegant, Elegancy and Mister Elegant. Meanwhile Rising Stock (pictured) - who is bred on both sides (sired by Tavistock) to get a bit of ground found winning form dropping back from a mile to 1300m! Also ridden by Luke Currie, the four-year-old travelled well throughout but looked to have the job ahead with the leader and second horse kicked clear from the turn. "I was not too confident," Currie admitted, "as they had got away on me." "It took him the whole way up the straight to pick them up but he toughed it out and was strong to the line, he did a good job." 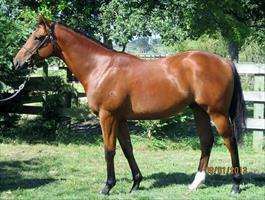 A five times winner from 21 starts, Rising Stock was purchased for a bargain price by Paul at the 2013 Karaka Select Sale. Paul knows the family well having also picked out Rising Stock's dam's multiple Gr.1 winning half-brother Wall Street.